Surfboarding, Yes. Skateboarding, Yes. But Whiteboarding?!? Here’s some of the information aLearning discovered as we looked a little closer at their use and at some of the products available. Web conferencing will continue to grow at about 11.5% (compound annual growth rate), from a $678.1 million industry in 2009 to $1.16 billion in 2014. Web conferencing dominates corporate training, though its use in virtual schools and universities is also widespread. Primary whiteboard use is within classroom teaching, with corporate staff development and training the second application in the US. Interactive whiteboards have been adopted to a larger degree in the UK; other countries are also using interactive whiteboarding at a higher rate than in the US in general. Wainhouse expects the interactive whiteboard market to grow overall from $886.5 million in 2009 to $1.98 billion in 2014, at a compound annual growth rate of 17.5%. With so many current K-12 students actively participating in interactive whiteboard learning, isn’t it time we started investigating what it could add as another tool in our toolbox? More hardware technology than software for the Web, these products allow “chalkboard” writing with the added advantage of capturing the content of the whiteboard digitally, so (with some systems) you can send it or post it via the Web. As with so many products like this, pricing is hard to come by online, and it seems as though you have to start with certain pieces and add to them if you’re starting from scratch. Some systems also include “clickers” for student responses to onscreen content such as quizzes, puzzles, games, and other interactions. Take a look around — and if you’re using one, please let us know! We’d love to hear about your experiences using this technology! Note to vendors — When you revise your Web content, ask people who don’t know about your product to take a look… you are not as clear about what your products are and what they do as you think. “Your classroom can be more interactive and collaborative with this product” doesn’t tell us a thing. I came to the topic of “interactive whiteboards” with the image of how whiteboards work in Web conferencing systems… and thought that your companies produced something similar — i.e., SW application rather than HW. Your descriptions didn’t help. Clearly your Web site marketing info is directed to those who are repeat customers or those who are otherwise familiar with your products. If you want to reach into other markets — trade and professional associations, for example — then including a “what this does and how it works and where to start” section on your sites would be very helpful. Or, to ask the bigger question, What State Is Association Learning In? What are the innovations, if any, that we’re seeing across the alearning spectrum? What challenges are we facing? I recently had the pleasure of chatting with Jeff Cobb over at Tagoras about these topics and more. He released the conversation as a series of podcasts and has now made the content available in a beautifully formatted written transcript. What innovations might we have missed that you’re seeing? What trends are emerging that we neglected to mention? What challenges are you experiencing that we overlooked? Join the conversation! 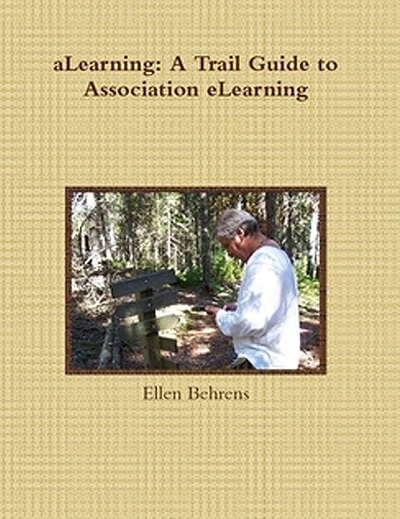 Tell us what state You and Your Association are in when it comes to learning in general and elearning in particular!